Meetings come in all shapes and sizes. Guidebook is made to fit all of them. The Nature Conservancy is the world’s leading conservation organization, and their mission to “conserve the lands and waters on which all life depends” is a giant undertaking. There are over 4,000 employees and 1 million members working worldwide to protect our lands and waters for the next generation, and they operate in all 50 states and in 35 countries around the globe. Keeping a global organization communicating effectively is no small task. Just ask Chaz Papa, The Nature Conservancy’s Director of Meetings Management. He works in the Office of the President and plans between 12 and 15 meetings per year for VIPs, the Board of Directors and senior management. 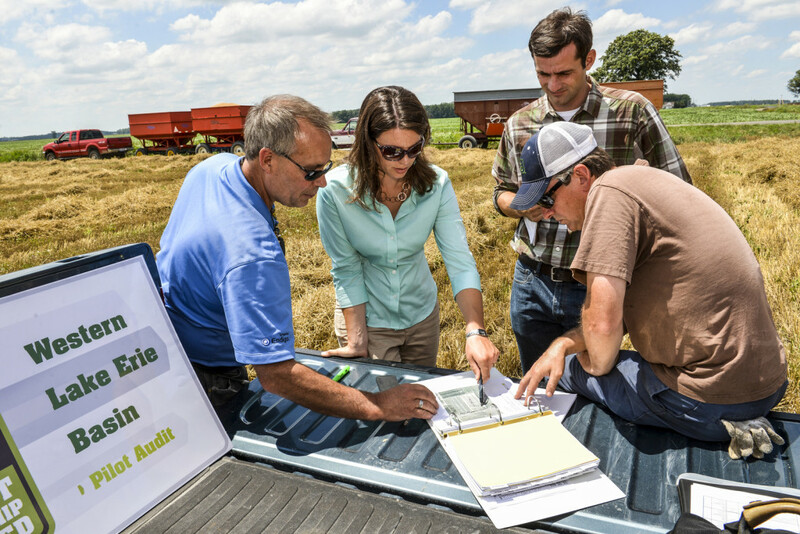 The Nature Conservancy works with farmers across the country. 12-15 high-profile meetings in a year may sound like a lot already, but add in the fact that each state is run by its own director and board of trustees and the need for effective meetings increases exponentially. Chaz worked with a team to begin looking for a mobile meeting solution, but it needed to work just as well for meetings of 10-20 people as it did for hundreds of attendees. Not to mention, The Nature Conservancy has a mission to conserve our planet’s resources, and all those schedules and speaker bios were using a lot of paper – and all that paper was slowing things down and driving up costs. 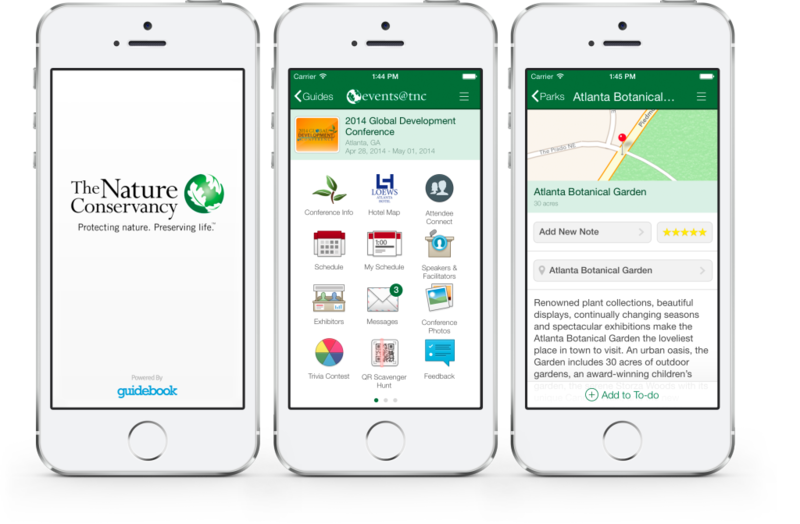 Chaz and the team found that Guidebook was able to provide The Nature Conservancy with an app branded with their look, and also delivered all of the features they needed to take meetings to the next level, at every level, in a user-friendly way. Guidebook’s platform is able to accommodate some of the more complicated aspects of The Nature Conservancy’s meetings, including allowing attendees to manage and maintain individual schedules and breakout groups all within the app. Things can change in an instant at a meeting, but it doesn’t take much for meeting organizers to update information within the app on the fly. Guidebook’s ease of use is now allowing for roll out through the entire organization – from global to local. Jessie Birckhead, a Conservation Coordinator from the North Carolina arm, has found Guidebook invaluable, even for their smaller regional meetings of 30-40 attendees. Jessie described past board meetings where lengthy hard copy materials had to be created and sent to board members well in advance. Board books, agendas, and supplementary materials were an absolute, but also subject to change before the meeting – often necessitating a reprinting just before the meeting. With Guidebook that problem is a thing of the past. Guidebook has helped TNC keep their meetings as green as possible while also adding new features that staff and trustees love using like photo sharing, schedules, and maps. The Nature Conservancy’s work extends around the world. 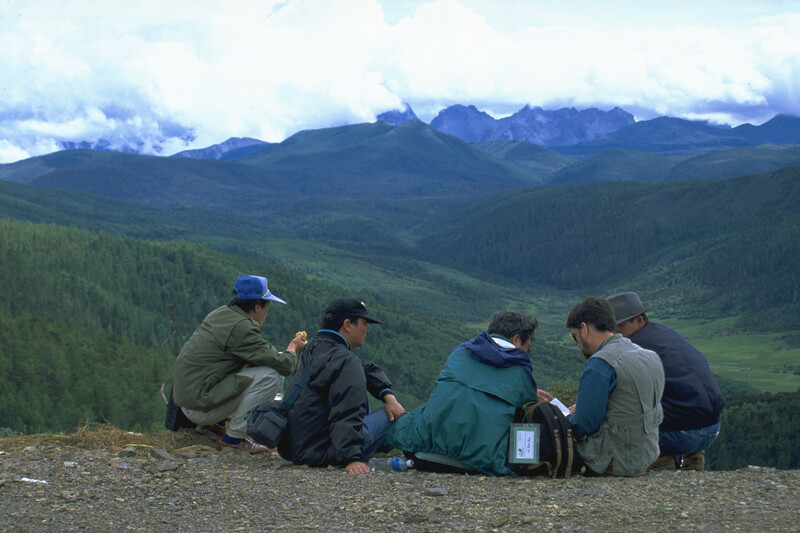 A project team takes a rest from field work in China. Now there’s an in-house team at TNC that helps regional branches build guides and strategizes about how to best use Guidebook within the organization. Jessie says that Guidebook was “easy to get started with and simple to use,” and it has now made itself an integral part of many of TNC’s smaller meetings. There has been great success creating guides for all levels of meetings and adoption rates are strong. The printing numbers tell a success story alone. Before using Guidebook, Chaz was printing thousands of pages. The first meeting after adopting Guidebook, Chaz printed 25% of the previous meeting’s paper. After noticing excellent adoption among his attendees, the next meeting he printed 25 sets total – and only five of them were used! For The Nature Conservancy, conserving earth’s land and waters takes a huge coordinated effort at all levels. Guidebook is helping them streamline their meetings – both large and small – and reduce their paper usage so that they can get on with the important work of saving the world. It also helps that everyone loves using Guidebook.